An Easter To Remember With Konga! What’s better a holiday? Another one! With another exciting holiday around the corner, the whole family home and friends visiting this Easter, you certainly want to get great deals on your shopping and have them delivered in good time. What better way to get ready for this season than to make sure you have everything you need for the holiday early at up to 25% off from the Konga Easter store? This is why Konga.com is guaranteeing 100% that it will deliver all your items before Easter. To enjoy this, you have to beat the rush and shop between Friday, 18th and Monday, the 21st of March 2015. So what are you doing this Easter? Whether you have some spots you’ll want to hang out at with your friends, or spending quality time indoors entertaining friends and family, make sure you get the best deals on everything you need for the season from the Konga Easter store and have them delivered in good time. Shop fabulous fashion items, home and kitchen items, clothes and toys for the kids, groceries, Easter cakes and other items you’ll need for holiday. You’ll also save 5% off your order total when you checkout with KongaPay. Skip all the traffic and let us deliver your orders. 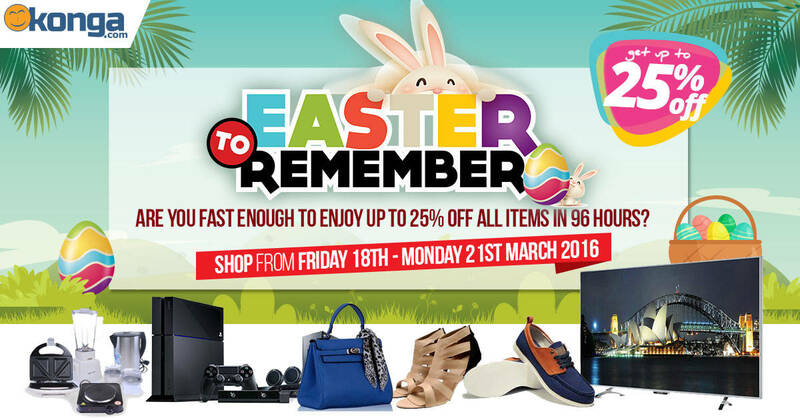 Click here to our Easter store from Friday the 18th of March. Remember, early to shop Early to deliver!